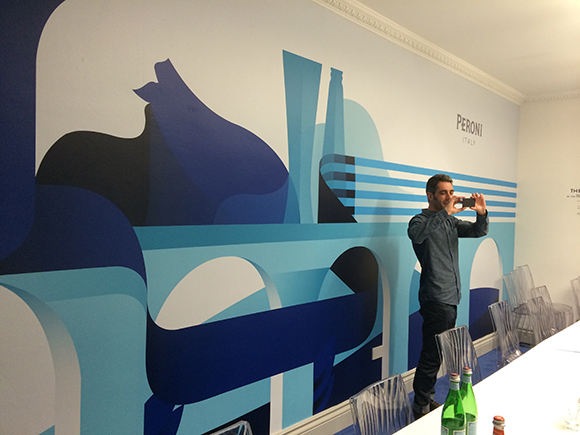 MACHAS | Discovering Rome: Ray Oranges at The House of Peroni. The guys of Vinyl Impression at work! A happy artist, is one who takes photos of his artwork with a well pleased face! Discovering Rome: Ray Oranges at The House of Peroni. As anyone who’d visited Rome will tell you, the Eternal City is a place of astonishing beauty. The golden light, the texture of the buildings’ surface and the insanely high concentration of historic remains per square meter makes Rome one of the most unique places on Earth. Even so reproducing Rome in images can be very tricky: its views have been so deeply engrained in our visual data base that quite frequently we are one step away from the stereotype, as Martin Parr showed in his brilliant Tutta Roma. 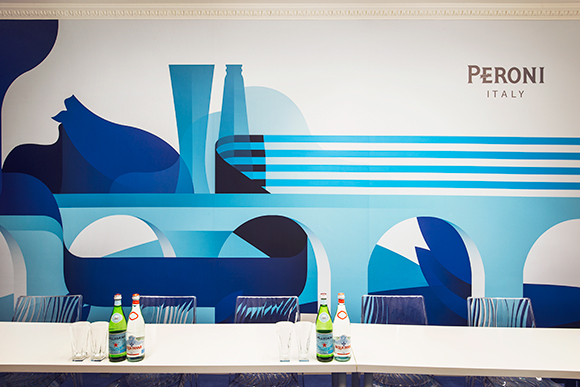 When Ray Oranges was called to join the second instalment of the House of Peroni event in Holborn, London, and create an installation for the client’s private Meeting Room, he was asked to capture the essence of the Nastro Azzurro’s birthplace through his contemporary vision. The brief required the artist to bring the true Rome to those who never been there or show a different angle to it, whilst focusing on the brand, its authenticity, vivacious and provocative spirit. 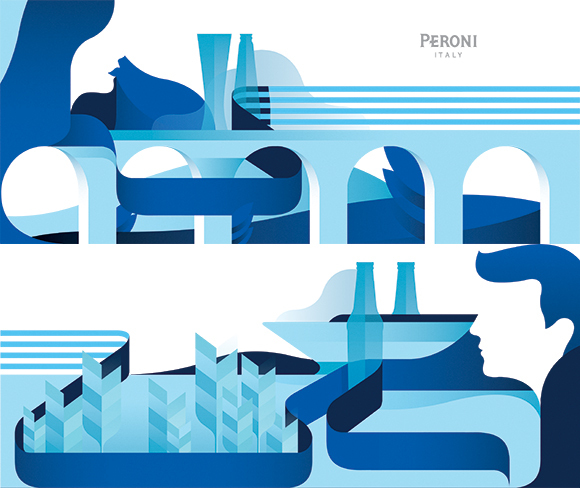 Ray used a visual representation of the liquid of the brew that tied elements dear to the Nastro Azzurro history together. The artwork created featured Ray’s trademark play with scale composition, where architectural elements are blended in with the landscape and people, drenched in a breezy blu hue. 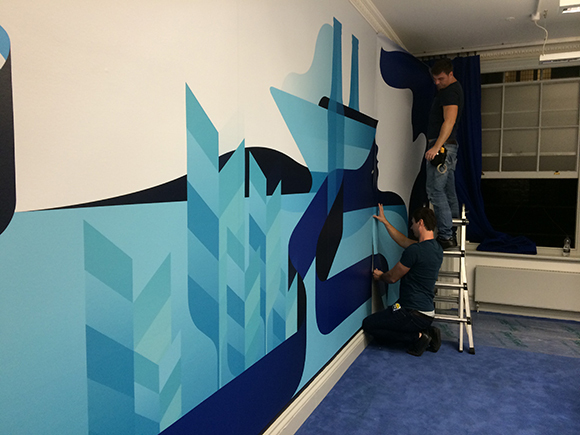 The sheer dimensions of the artwork, which totalled to two 6.50 by 4,20 meters panels that were going to be installed in the meeting room, required particular attention to the production phase, as such a beautiful artwork deserved an excellent delivery. 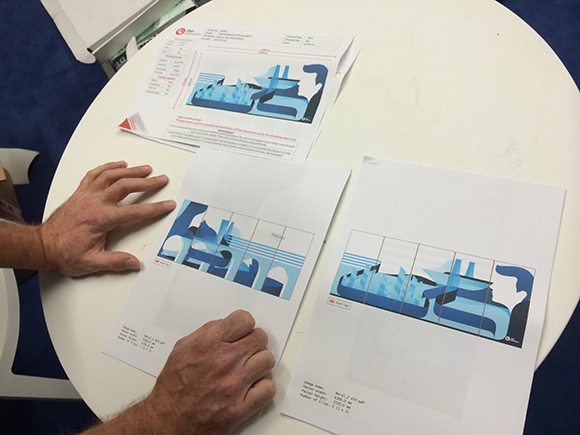 The team at Machas knew exactly who could deliver such project to the highest standard and picked up the phone to call the lovely people at Vinyl Impression. Ed the owner and Joe worked side by side with us to make sure that every detail would be looked after and that the installing phase would be an extremely straight-forward process. The result? Ray’s artwork was printed on a premium matte vinyl which had a fantastic texture, leaving most of the guests baffled to know that it was indeed vinyl. The client was particularly satisfied with Ray’s interpretation of the brand that steered away from pointless corporate celebration and delve deep into beauty and taste. See more of Ray’s artwork here.